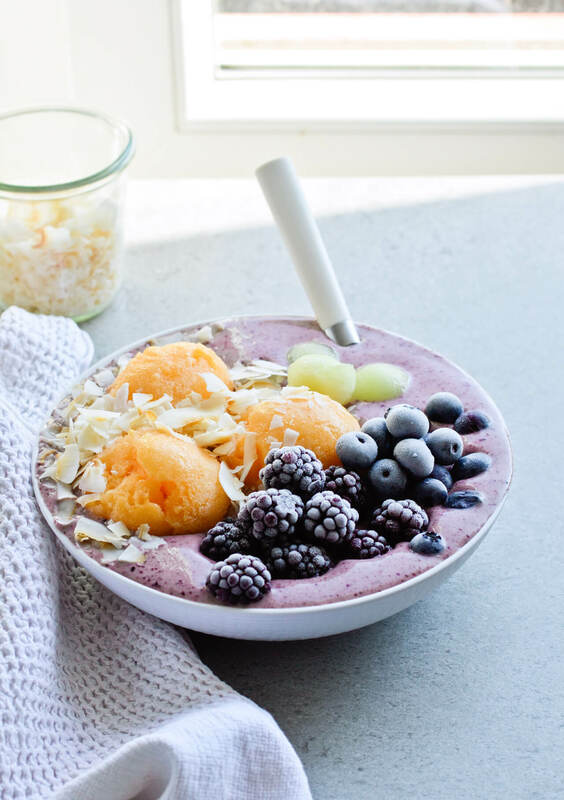 When you want a healthy, filling breakfast make a berry banana frozen smoothie bowl! Have I told you guys that I wrote an article for the Autumn issue of Artful Blogging? I don’t think I have. Well, now you know! I’ve been keeping this to myself for moooonths! It’s always funny when I finally get to share something and then don’t know how to do it. How do you casually share something that isn’t news anymore? To me at least. But it’s still important, just not exactly ordinary? Anyway, the magazine is out and you can get it here. It’s filled with beautiful photographs and articles written by many talented people. If blogging interests you, it’s worth picking up. I’m so happy we’re in September now, although it’s not sweater weather just yet. I can’t wait for that because I actually like feeling a little cold. Just cold enough that I can put on a coat or wrap myself in a blanket. It just makes life cozier, you know? But I am still making advantage of the warm weather and the fruit that comes with it. This is the perfect time to buy whatever is left of berries and stone fruit and freeze everything for later. Of course, jams and compote are amazing too, but I like having frozen fruit in the freezer. 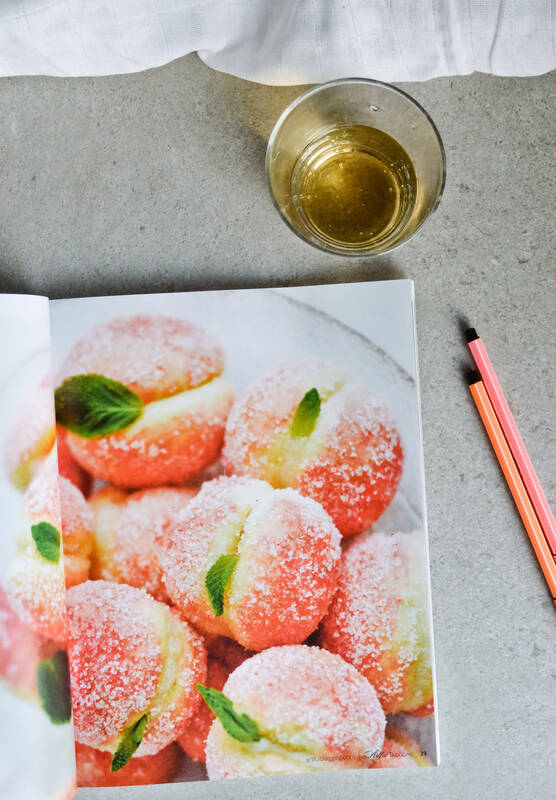 Just imagine it’s snowing outside and you can pull out some peaches from the freezer and make a warm peach sauce to pour over pancakes? Or make a blueberry pie that’ll taste just as the one you made in July? 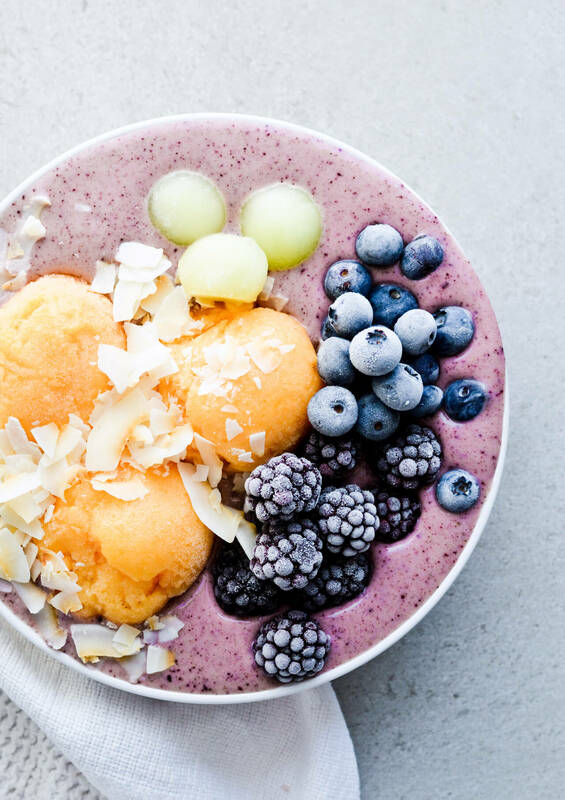 Frozen fruit is also perfect for smoothies. 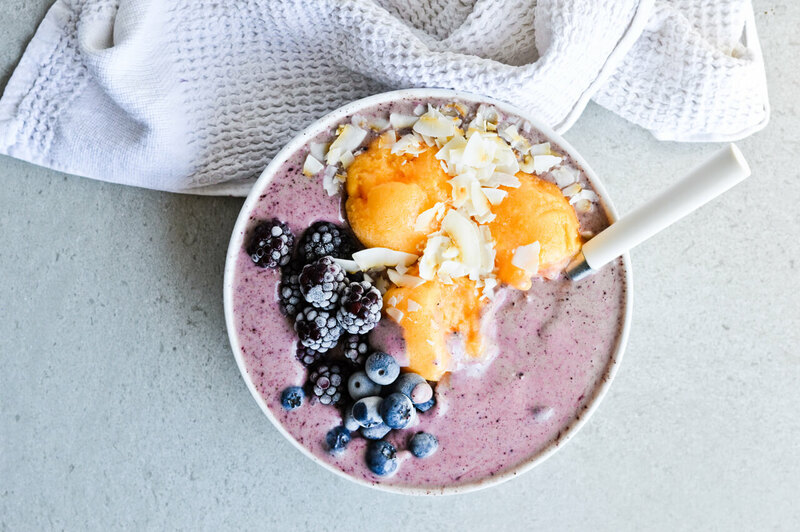 Enter this Berry banana frozen smoothie bowl. This is so simple to make it’s hardly a recipe, but if you’ve followed me for a while you know that I’m a sucker for smoothies and all the different combinations. They just never get boring. 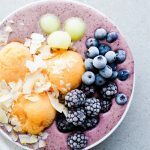 This Berry banana frozen smoothie bowl is huge, big enough for a super healthy lunch or a breakfast for two. As it’s made with frozen fruit it’s pretty chilly, but it’s what I like on a hot day. And also it kind of forces you to eat it slowly, which I never do with breakfast, so it’s a perfect solution for that problem. I love to put a lot of berries in there and the mandatory coconut chips, which just make everything better. The sorbet is the big optional ingredient and I can tell you right now that while it works with the berry flavors so well, it takes some time to make. I think you should try it, but I also understand that you don’t have all the time in the world, so in that case just chop a peach instead and throw that in the mix. 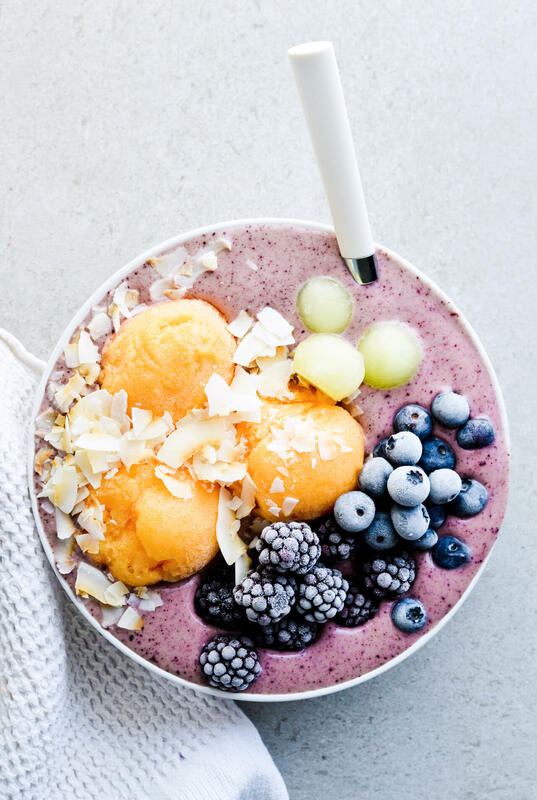 Icy and packed with fruit! A great breakfast or even lunch. Big enough for 2. Transfer bananas, coconut water, yogurt and acai powder to a blender or food processor. Blend on high until the mixture is completely creamy. Taste to see if you want more yogurt or coconut water. Transfer smoothie to a large bowl. Top with berries, coconut chips, melon balls and peach sorbet (if using). You can easily use only 1/2 of the ingredients for a smaller portion. Or you can freeze 1/2 of it and make smoothie “ice cream” scoops instead of using the sorbet.